CMTS 2017 Hexagon - CMM Inc.
Be our guest with a complimentary Exhibit Hall Pass! Solve Your Toughest Metrology Challenges at Booth #1737! Hexagon Manufacturing Intelligence will be at the International Center for CMTS September 25 -28, 2017. We will be showcasing our Portable Measuring Arms, Laser Tracker Systems, CMMs and 3D Optical Scanners geared to helping you drive productivity. For more than 30 years, Canada’s leading industries including automotive and aerospace have come together at CMTS to source solutions and knowledge from the global leaders in machine tools and tooling, metalworking, and advanced manufacturing. We will have our newest metrology solutions on display, featuring our latest sensing, thinking and acting technologies. Talk with our product experts and learn how you can improve your operation's productivity. 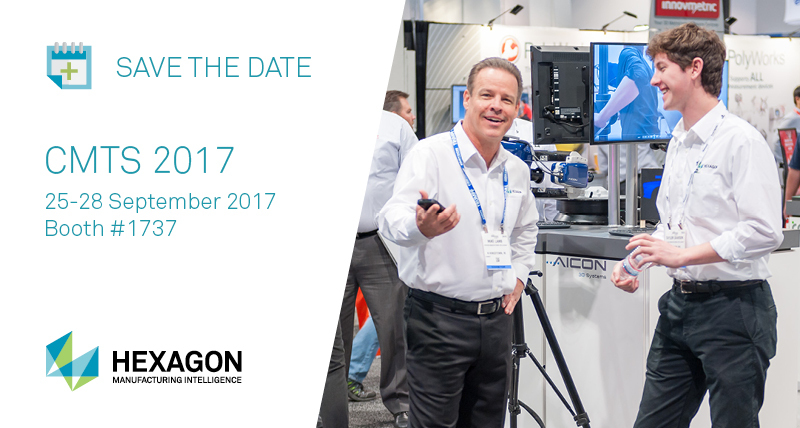 Get hands-on experience with the latest technology from Hexagon Manufacturing Intelligence and in-booth demonstrations. We will be located at booth #1737. To receive your free Exhibit Hall Access pass to CMTS 2017, click the button below to register.